Lebron James Considering Taking His Talents Back To Cleveland?! WTH! 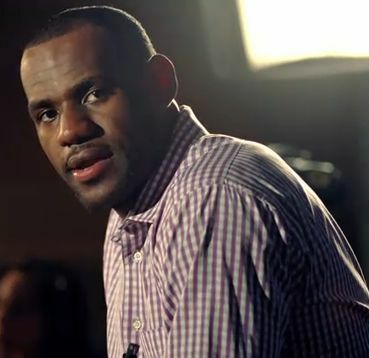 LeBron James says he could picture returning to the place where his NBA journey began. Back in Cleveland. After practicing in a gym where he refined his game for seven seasons, James said Thursday he would not rule out a return to the Cavaliers, the team he carried to the brink of a championship before he spurned an entire region by leaving as a free agent for Miami in 2010. Asked if he could play for the Cavs again, James initially paused before giving his answer. “I don’t know. I think it would be great,” he said. “It would be fun to play in front of these fans again. I had a lot fun times in my seven years here. You can’t predict the future and hopefully I continue to stay healthy. I’m here as a Miami Heat player, and I’m happy where I am now, but I don’t rule that out in no sense. James put Cleveland back on the NBA map by taking the Cavs to one finals and winning two MVP awards during his stay. He left the franchise during a summer in which he held an entire city at bay as it awaited his decision. After he announced he was joining the Heat during a nationally televised special, the Akron native was vilified by the same fans who cheered every one of his dribbles and dunks. Time has healed some of the wounds — not all. James has made no attempt to patch things up with Cavs owner Dan Gilbert, who harshly criticized James in a scathing letter to Cleveland’s fans. Gilbert promised to win a title before James, questioned his character and told The Associated Press he felt James quit on the Cavs during the playoffs. James said he has no bitterness toward Gilbert. They have not spoken since James met with the Cavaliers on July 3, 2010, when they were one of several teams courting him to sign with them. James, however, said he can envision being friends again with Gilbert. “I don’t hold grudges,” he said. “I hold them a little bit, but I don’t hold them that long. He said what he said out of anger and he would probably want to take that back. But I made a mistake, too, and there are some things I would want to take back as well. On Friday night, James will play his third game in Cleveland since leaving. The reception won’t be nearly as hostile as it was on Dec. 2 last season toward James, who spent the past two days at his colossal home he has kept in nearby Bath, Ohio. James expects to be booed, but it won’t be as nasty as before. James’ comments about a hypothetical return to Cleveland didn’t surprise teammate Dwyane Wade. Could Wade imagine James with the Cavs again? Next Nikki305’s Video Of The Week!! @2nyce305 ft @SitoRocks Esta Fiesta! !